I. Exactly 15 years ago, at the 11th World NDT conference in Las-Vegas (USA), Dr. Robert Mc. Master presented remarkable report "A look ahead and nondestructive testing". In that report he formulated the general goals and prospects for NDT development. He was right in many aspects. In this paper an attempt to analyze obtained results and still unresolved and, it means, still very promising for further development of NDT issues will be made. The experience of NDT development in Russia will be used to illustrate the subject under consideration. First of all, it is necessary to underline the following fact. Previously, the term NDT was widely used to establish and describe the compliance of the object parameters and certain technical requirements. Nowadays, in parallel to the term NDT, the term technical diagnostics (TD) is used to describe the technical condition of the object as a whole. Today, the most challenging tasks are estimation of object' residual life, the risk level during its operation, the measurements uncertainty, etc. In connection with the tendency, that technical constructions became more complicated, the technical diagnostics became more important direction of activity of specialists in NDT field. At the very beginning of the 21st century and of the 3rd millenium many are trying to point out the main scientific issues and most challenging areas of research works. They foretold that the 21st century will became the century of informatics, biology and a number of some other science development. Nevertheless, it looks like, during the 3rd millennium the mankind will face the most important problem and this is scientific, legal and management provision of safety in the very wide sense: safety of human being, of his family, of enterprises, of cities and towns, of districts and regions, of countries and the planet itself. The basic component of safety issue is NDT and diagnostics, but this fact, unfortunately, is not always recognized in practice. II. At present, four major diagnostics directions are been developing, these are: medical, technogenic, criminological and ecological diagnostics, and this statement will be illustrated in this paper by examples of developments done by MSIA 'Spectrum' (Russia). At the heart of all diagnostic areas are well-known physical principles and methods (Table 1) - magnetic, electromagnetic, ultrasonic, UHF, optical, infrared, radiographic and others. The main principle of operation is to register corresponding physical diagnostic parameters. These parameters may be kinematic, geometrical, static, dynamic, molecular, thermal, acoustic, electric, magnetic and others (see Table 2). Unlike the infinite number of technical inspected parameters the total number of physical diagnostic parameters does not exceed some 200 and these parameters are amenable to systematic analysis providing the derivation of diagnostics equipment sequences. III. The first place between all soled in the world means for NDT and diagnostics belongs to the medical diagnostic equipment. The implementation of medical diagnostic means became a must during medical treatment of millions of sick people, such situation is seldom met in the practical use of technical diagnostic means. Unfortunately, the safe methods and means of medical diagnostics - optical (endoscopy), thermal (thermovision), ultrasonic (sonicvision), electrical (cardiographs) and others can not replace the roentgenology. The density of its use in Russia is more than 70%. Such medical examination creates additional component in radiation background (approximately 280% of the natural radiological background) and as a result has the greater impact on the population health. That is why the main direction in the roentgenology belongs to the development of low dose radiological equipment of general and special applications, including tomography and fluoroscopy with the X-ray image intensifiers and the digital processing. At MSIA 'Spectrum' a number of means for medical diagnostics has been developed (App 1), these are: the low dose flourograph FSTs-701 with internal image intensifier and digitized image synthesis option. The angiography complex 'ANKOR-1", mobile roentgenodiagnostic apparatus for surgery, stationary X-ray complex with image intensifier for 50 kW. The total number of roentgen diagnostic equipment some 100 units. The main direction of these instruments development is improvement of their information content and safe operation, i.e. the reduction of possible harm to the health of patients, the enhancement of technical parameters - operation rate, metrological features, weight and mass reduction, maximal use of modern achievements in the field of visualisation, digital and multi-dimensional data processing . IV. On the second place, from the point of number of application areas, are methods and means for technogenic safety. In this group more than 100 physical test methods and more than 1000 different units types are used comprising means for defectoscopy, structuroscopy, examination of physico-mechanical properties and size gauging, vibrodiagnostics, etc. It is common knowledge that use of technical diagnostic is a must when their is a task to solve the problems related to the safe operation of comprehensive technical systems in energy, machine building as well as at defense, nuclear, biological and airspace and other facilities. Only all over the Russian territory there are some 100 thousands hazardous facilities including 1500 nuclear reactors, above 3000 large chemical and biological entities more that 200 thousands km of oil and gas pipelines and in nearby areas live some 80 mln civilians (Figure 1). Yearly in Russia more than 850 technogenic accidents happen, i.e. at least 2 accidents a day. In the future the situation forecasted as worth and this is due to aging of assets and unfavorable economics that does not give a chance to provide replacement of old equipment and proper maintenance of existing one. In Russia approved the special program of NDT means development for the period of years 2000 - 2015 (Table 3), i.e. to develop and to put into operation at least of 630 types of instruments covering all NDT methods, with sales volume some 3 bln dollars. 2000 2015 2000 2015 2000 2015 Multifunctionality, expert system.Expansion of micro- and macrorange. Improvement of metrological characteristics. increase of response rapidity 2000 % 2015 pieces 2000 % 2015 m. dol. In App. 2 are presented a wide range of the instruments and means developed at MSIA 'Spectrum'. 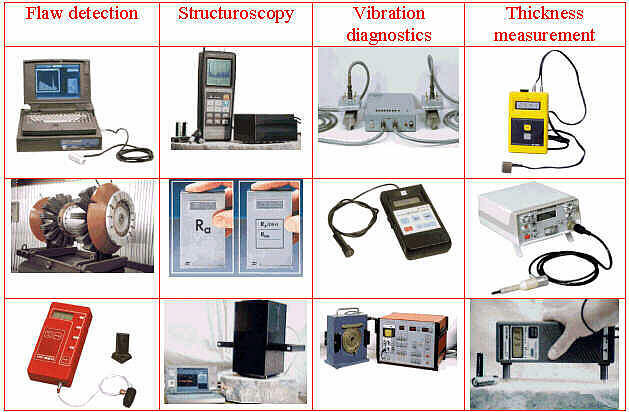 These are: defectoscopes, structuroscopes, size gauges, vibrodiagnostic means and other equipment for inspection of oil and gas pipelines, metal-rolled products, airspace technique, for concrete and other objects examining, - above machines implement magnetic, electromagnetic, ultrasonic, optical, thermal, radiographic and other NDT methods. V. Fifteen years ago Dr. R. Mc. Master could not assume that in year 2000 the criminology detection and military applied diagnostics will receive such a wide development. The current problem existing and important all over the world is the detection of arms, explosives, drugs, radioactive and nuclide sources as well as exposure of false documents and notes, territories protection, watching after the personnel, etc. (Table 4). The super actual problem that for the first time will be widely discussed within the frames of 15th World Conference on NDT is the problem of the antipersonnel landmines (APsL). This problem is really a burning one in some European countries and in Russia and some former USSR territories. It is really offensive and shameful to say that up to now the mines are detected with the help of a dog and a stick. For the last few years in MSIA 'Spectrum' some 40 types of instruments for criminological diagnostics were developed (App. 3), including comparators using visual, infrared and ultraviolet radiation ranges, X-ray fluoroscopes, magnetic and electromagnetic metal detectors, laser and X-ray TV systems, thermovisors, optical test systems, etc. At present, the multi-channel mines detector implementing various physical principles is under the development. The future tendency is that the means for criminology detection will be constantly improving and developing. IV. In spite of all mentioned above, if to take into account all material losses from emergency situations, about 70% of losses in Russia are caused by ecological-natural and biology-social catastrophes (Figure 2). The same conclusion can be done for many countries in the world. We must carry out the diagnostics of environment and while doing it to use all available NDT methods to forecast as early as possible the coming earthquakes, floods, hurricanes, fires, dry periods and other natural anomalies. In 1999 in Russia three earthquakes happened, 60 hurricanes and tornados. During the period from January until May of year 2000 the fires in Siberia and Far East destroyed 220 thousands hectares of forests, the big fire in the USA in the area of Los Alamos in May, this year, destroyed 2000 sq. km of forests as well, etc. Not to mention further, the billions of losses are due to the naturally occurring emergency situations and taking into account the fact of there imminence and very difficult forecasting, in this paper it is necessary to stress out that ecological diagnostics will became one of the most important directions of the NDT development in the 21st century (Table 5). Chemical Atomic absorption spectroscopy, electrochemical, mass- spectrometry, conductance measuring, bioluminescent analysis and so on. Universal analytical equipment, gas analyzers, spectrometrics, analyzers, chromatographs. Optical Television, spectrometry, lidars method, polarization-optical and so on. Photo and TV systems, optoelectronic spectrometers, Fourier-spectrometers, scanners, lidars. Ultraviolet UV-reflectrometry and refractometry, luminescence analysis, UV absorptiometry, measure of albedo Scanners, lidars, albedometers. Ozonemetric Measure of concentration ozone , analysis UV luminescence Ozonemeters. Magnetic, Electrical, Electromagnetic, Low frequency Magnetometric and measure magnetic fields induction, ferro probe, Hall and magnetoresistive transducer, NMR method, electro capacitance method Magnetic dosimeters, Hall`s transducers, ferroprobes, magnetoresistive induction transducers. Thermal Noncontact colar, radio, brigtness pyrometry, laser thermometry, infrared imaging . 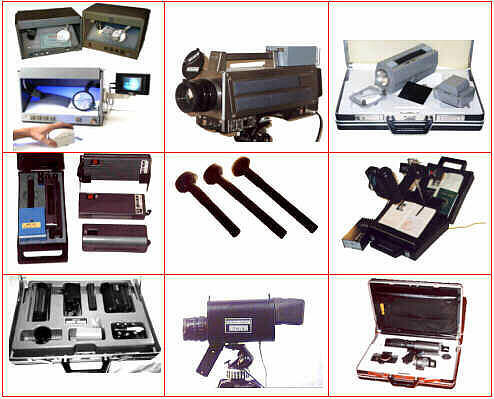 Infrared imagers, scanners , pyrometers, spectrometrics and so on. Radio Doppler, radiolocation, microwave thermometry and radiometry and so on. Radars, polarizing radiometers and so on..
Vibration, noise Kinematic and dynamic method of measure, spectral analysis, method of diffusion (or reflected) acoustic field, method of free acoustic field and so on. 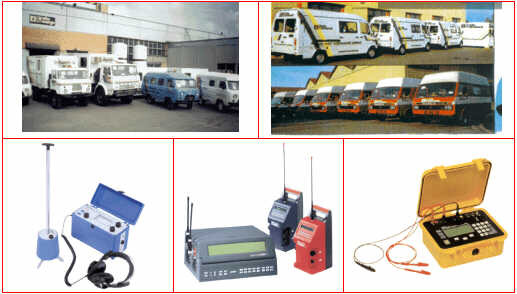 Vibrometers, accelerometers, sound level meters, analyzers of noise, meters of power acoustic and so on. Earthquakes diagnostics Definition periods of high probability of earthquake occurrence, appraisal regularities of seismic conditions dynamic, and so on. Seismic and acoustic sensors, diameters, strainmeters, magnetometers, geo chemical sensors and so on. At the same time, it is important to mention that diagnostic methods, means, algorithms, as well as, measuring channels, physical phenomena, units for transformation and sensors to achieve the goals facing the environment diagnostics are practically the same as for human beings and technogenic objects diagnostics (App. 4). The ecological diagnostics implements the results of many years research works carried out in space and over the processes ongoing inside the planet, as well as results of atmosphere and water reservoirs, flora and fauna monitoring. Very bright sample of the global importance of the ecological diagnostics is an earthquakes forecast. Earthquake forecasting technologies and used measuring methods (Table 6) ranging from the long time systematic prognoses to magnitometric, geochemical, hydrodynamic, electric, seismic, deformation and other measurements. To carry out forecast, the following means are used: deformation registers, tiltmeters, hydro level gauges, magnetometers, electric field and resistance gauges, measuring channels of acoustic and electromagnetic emission, geothermal, hydrogeological, biological and others (Table 7). At present, in Russia some 20 procedures and technologies of earthquake forecasting have been developed. Created the net of seismic stations, but huge territories of the country requires much more investments for monitoring of many kilometers spaces, for modernization of the stations and there equipping with modern measuring, diagnostic technique. The requirement of the day is creation of stationary and mobile land based, airplane based and space based monitoring systems. Another central task of the day is detection of environmental radiation contamination. It is necessary to detect g - , a - , b - radio nuclides, the products of nuclear blow ups, to estimate the activity of radon and thoron, of cesium, strontium and other substances. For this very purpose, today more than 100 different types of instruments are used: radiometers, g - , a - , b - spectrometers, various dosimeters and other technical means. The next task is a pollution control. Identification of air gas content, aerosols concentration, oil spills, flora condition and many other task may be successfully solved with the help of optical method. Today the laser search is common as well as luminescent, spectrometric, TV- methods, photometry and others. More than 300 types of optic instruments are known and they used for investigation of atmosphere, water, soils and biotics. This instrument list includes various types of leadars, spectrometers, DCC-cameras, reflectometers, luxmeters, brightness meters and other devices. Solution of various thermal ecological tasks is found due to specific thermal diagnostic methods. More than 150 types of thermovisors, radiometers, pyrometers, thermometers, liner scanners and other instruments are used for monitoring of gas pollution, of heat leakages, fires, geothermal activity, etc. Many tasks in connection with the estimation of humidity, rainfall volume, water-salt balance, water, snow and ice deposits and others may be solved by use of radiowave diagnostic methods, including: radiometric, radiolocation, TV, polarization, radioholographic, resonant, geometrical, time. More than 50 types of UHF diagnostic ecological devices are available: radiometers, radars, microwave scanners, radio height gages, meteorological parameters meters and others. Nevertheless, it should be mentioned that most wide range of instruments, procedures and methods has chemical-analytical direction of diagnostics (Table 8). Hundreds of types of contaminants are well known. For atmosphere these are - dioxides and oxides of nitrogen, sulfur dioxide and sulfuric acid, ammonia, ferric, nickel, copper and there compounds. For hydrosphere and soil these are: nitrates, nitrites, chlorides, sulfates, fluorides, mercury, lead and others. The contaminates may be detected or find out with the help of portable devices, stationary stations, mobile laboratories based on cars, railway or marine transportation means as well as with the help of systems installed in airplanes or helicopters and on airspace stations. Officially, in Russian there are 707 procedures, guidelines and technologies for chemical analysis of atmospheric air, atmospheric aerosols, rainfalls, industrial waste products and pollution, drinking water and natural water, purified sewer and sea water, of bottoms as well as of biological parameters. For these purpose tens of methods like gas chromotography, electrochemical, photometry, fluorescent, infrared, ultraviolet, atomic emission, NMR, gravimetric, conductometric and others are used. These methods are used in hundreds of mobile laboratories and realized in many instruments. At present, the Russian register GOSREESTR comprises more than 250 different gas analyzers for atmosphere, devices for soil and hydrosphere' physico-technical parameters examination. At the same time these registered devices are in compliance with the requirements of 213 standards of ISO system. To this list 64 all-purpose instruments for chemical analysis can be added. In such a way, chemical-analytical direction of ecological diagnostics development is the most knowledge consuming and most widespread. In total the direction of ecological diagnostics, including the methods of biological diagnostics, comprises more than 1000 types of devices and measuring channels, above 2000 procedures and diagnostic technologies. The yearly volume of sales in Russia of this means is more than 3 bln USD. The common tendencies of diagnostic technologies improvement will be as follows: intellectualization, multifunctionallity, micro-miniaturization, improvement of technological and metrological parameters, automation, wide use of all types of monitoring, especially of cosmic one. As a result, efforts made in this direction will save thousands of people lives and huge amounts of money due to the reduction of emergency situations consequences.